High-level positions in education should open over the next few years as baby boomers continue to retire. Among the many job openings are positions for principals, many of whom earn more than $94,000 per year. To become a principal, you generally need five years of classroom experience and an advanced degree, such as a doctorate in education. In this article, learn more about advanced online teaching degrees, program selection, and possible careers. What Else Can I Expect From an Online Doctorate in Online Teaching Program? 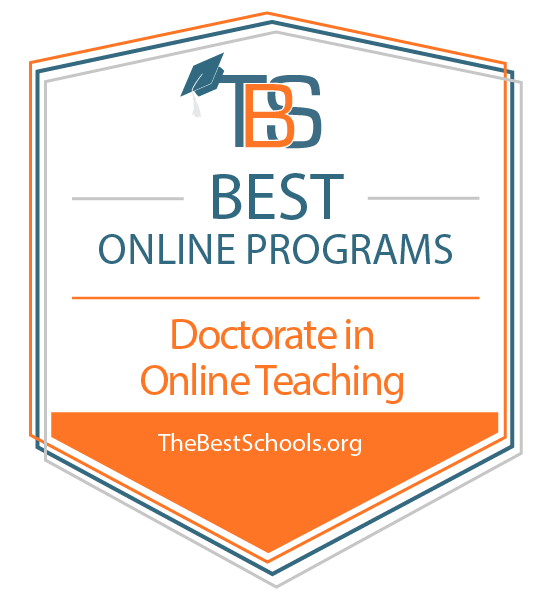 Online Doctorate in Online Teaching Degree Program Ranking Guidelines: We selected the degree programs based on the quality of program and range of courses provided, as well as school awards, rankings, and reputation. A private, nonprofit university with approximately 8,000 students located in Malibu, California, Pepperdine's online teaching degree fosters exploration of advanced computer-based learning technologies. Distance learners are prepared for careers in K-12 and post-secondary educational environments and specialized positions at museums and libraries. This 51-credit program typically takes full-time students around four years to complete. For this hybrid degree, learners must attend some courses in person at the Malibu or West Los Angeles campus. To apply, students should provide transcripts from all previously attended colleges and universities, GRE scores, a writing sample, and a personal statement. Applicants must also hold a master's degree. Prospective students who pass the first round of admissions will undergo a personal interview with Pepperdine faculty members. Pepperdine is regionally accredited from the Western Association of Schools and Colleges Senior College and University Commission (WSCUC). UF is a public research university in Gainesville with a student body of over 55,000. It offers a hybrid cohort learning program for those seeking a doctorate in education. This online teaching degree emphasizes educational technology and specializes in training professionals who conduct research related to technology in educational environments. Of the 54 required credit hours, there are only three on-campus obligations: one two-day orientation and two four-day summer sessions at the end of the first and second years. Distance learners work through coursework with their cohort for the first two years, then prepare for qualifying exams at the end of year two. Upon graduation, students are ready for full-time work in K-12, post-secondary, online, and nonprofit instructional positions. Applicants must submit GRE scores, a statement of purpose, a writing sample, and letters of recommendation. UF is regionally accredited from the Southern Association of Colleges and Schools Commission on Colleges. U of I is a public research university that features an online education program in learning design and leadership. This doctorate in education helps educators create new and engaging learning environments with new media technologies. U of I's education faculty challenges distance learners to be innovative and progressive with a 64-credit curriculum. All doctoral students must complete a dissertation. Online students may also pursue doctoral education degrees in diversity and equity in education, global studies in education, and human resource development through U of I. Applicants must submit a personal statement, resume, GRE scores, letters of reference, and official transcripts. Prospective students must have a master's degree with a minimum 3.0 GPA. U of I is regionally accredited from the Higher Learning Commission. UW in Laramie prepares the future leaders of K-12 educational leadership with its doctor of education degree. This online teaching degree positions online learners to take the Wyoming state board superintendent's endorsement upon completion of 26 core credit hours and a required internship. In total, doctoral students must complete 77-80 credits for graduation. During the final six credits, students write a dissertation. Full-time students can expect to spend four years completing degree requirements. Applicants should have a minimum 3.0 GPA in their master's program plus GRE scores of 147 or higher in verbal and quantitative, and 4.0 in analytical writing. Prospective students should also have a minimum of two years of K-12 administrative experience and a record of leadership at the district level. Applicants must also submit strong letters of recommendation along with a letter of application and a current resume. UW is regionally accredited from the Higher Learning Commission. The education program is accredited by the Council for the Accreditation of Educator Preparation. Established in 1932 with a student body of over 24,000, BSU's doctorate in educational technology focuses on the use of current and emerging technologies in K-12 educational settings. This online teaching degree boasts curriculum in online teaching and learning, technology integration, educational technology leadership, software development and mobile platforms, and educational games and simulations. In addition to 66 core credits, all doctoral students complete an education specialist final project with written and multimedia components. Applications must include a cover letter, resume, writing sample, transcripts, GRE scores, and contact information for three people who can provide letters of recommendation. BSU is regionally accredited from the Northwest Commission on Colleges and Universities (NWCCU). Located in Fort Lauderdale, Florida, NSU is a private, nonprofit university with over 21,000 students. The doctorate degree in education with a concentration in instructional technology is a 54-credit online program which requires only one visit to campus. The degree is designed for current practicing professionals with backgrounds in teaching or administration. Since all doctoral students must produce a dissertation as the culminating project, they receive instruction in qualitative and quantitative research methods. Doctoral students typically complete all course credits and the dissertation in three years. The on-campus requirement takes place at the Fort Lauderdale campus, is one week long, and can be completed during any summer semester. Applicants must have a master's degree from a regionally accredited institution with a minimum 3.0 GPA and submit a GRE or MAT score. NSU is regionally accredited from the Southern Association of Colleges and Schools Commission on Colleges. The College of Education at Nova Southeastern University is accredited by the National Council for Accreditation of Teacher Education (NCATE). Among 18 fully online graduate degree programs, UWF in Pensacola offers a doctorate in education with a specialization in instructional design and technology. The 66-credit program readies students for leadership roles in education, implementation of innovative instruction techniques for learning environments, and conducting applied research studies. Within this specialization are two concentrations: performance technology and distance learning. The former concentration is for online learners investigating how instructional technology can improve educational programs, while the latter targets online doctoral students developing expertise in the theoretical constructs and best practices in the design, implementation, and evaluation of distance learning. Prospective students must already have a master's degree with a minimum 3.5 GPA and recent GRE or MAT scores. UWF is regionally accredited from the Southern Association of Colleges and Schools Commission on Colleges. The online education program is accredited by the Council for the Accreditation of Educator Preparation. ODU is a public research institution with over 25,000 students. Located in Norfolk, Virginia, this online teaching program allows distance learners to focus on instructional design and technology. This 60-credit Ph.D. in education prepares students for in-demand, technology-driven careers at college and universities, public and private learning organizations, and in the military. Degree candidates focus on instructional design techniques, human performance technology, and distance education. All classes include cognitive theory, research, and practical application components. Online students can also earn a modeling and simulation certificate at ODU by completing four additional courses. Prospective students should have a master's degree in a related educational or technology field. Applications require official transcripts, a cover letter, three references, and official GRE scores. Students pursuing this online teaching degree must maintain a 3.25 GPA or higher in all major courses. Regent is a private Christian university in Virginia Beach. Its doctoral program in educational leadership with a concentration in technology and online learning readies degree seekers for teaching and leadership careers in K-12 programs, higher education, and corporate settings. To graduate from this online education degree, students complete 75-77 credit hours. During the final semester of coursework, degree seekers must take the departmental examination to advance to candidacy. Online learners then conduct original research and write a dissertation that demonstrates technical competence in the field and strong research skills. Applications should include a resume, official transcripts, and GRE scores. Regent is regionally accredited from the Southern Association of Colleges and Schools Commission on Colleges. The educational leadership program is accredited by the Commission of the Council for the Accreditation of Educator Preparation. First, decide whether you want to pursue a Ph.D. or an Ed.D. Most Ph.D. candidates plan to teach in higher education, improving their own students' teaching skills and performing research on teaching best practices. Ed.D. graduates generally aspire to work as administrators, improving the educational system at the local, state, or national levels. An Ed.D. student may develop a policy change for her school or district and use the results as her dissertation's foundation. Once you decide which degree works for you, investigate online teaching degrees that offer concentrations fitting your academic interests and postgraduate career plans. Most program concentrations emphasize educational leadership, research, and the overlap between education and public policy. Some programs boast unique concentrations such as international education. If a Ph.D. or Ed.D. program lacks concentrations, it may still allow you to tailor your education through independent study, research projects, or the dissertation. If you have a question about a program's courses or concentrations, contact that department to learn more. Your educational experience depends on the course and concentration offerings at the university you attend. For this reason, invest time researching the courses and concentrations offered by the online programs on your shortlist. In the next two sections, learn more about popular concentrations and courses offered by the nation's best online programs. As the name implies, this concentration attracts doctoral students who plan to continue teaching after graduation. Courses focus on the evolution of teaching best practices and how educators can create equitable learning environments. Like all concentrations on this list, students also take research courses that prepare them to write their doctoral dissertations. Higher education administration students study global trends in education to understand administration techniques that can benefit U.S. colleges and universities. Coursework stresses legal and economic issues colleges and universities face in the 21st century. Students can further refine this concentration by selecting electives in leadership, curriculum theory, or urban education. This concentration prepares students to reform educational institutions. In class, students master topics such as the interaction between schools and their communities. Organizational leadership students aspire to improve underperforming school systems and struggling postsecondary institutions. In this course, students hone the academic skills required to excel in doctoral programs. In a teaching degree online program, a classroom activity might include analyzing a dissertation's strengths and weaknesses. All doctoral students take this or a similar course when they begin their programs. Doctoral students often take one to two research design courses before they begin the dissertation process. Students analyze different research methods and practice fundamentals such as writing a thesis, crafting a research plan, and creating an outline. This course appeals to students who want to correct racial and socioeconomic injustices many students face during their education. Students analyze the history of social justice in the classroom along with the issues standing in the way of equitable education for all students. This course provides future postsecondary administrators knowledge of legal topics that affect higher education, such as campus safety reform and sexual harassment. In this course, students learn how to reform an organization's leadership structure. To discover effective solutions, students analyze reform efforts from around the country and around the world. Students who excel in this course often work as advisors at colleges, universities, or school districts. Principals at the elementary, middle, and high school levels implement new policies, evaluate teachers' performance, and act as their schools' spokespersons. Many schools and districts require that principals possess a doctorate; these employees often benefit from an automatic salary increase. Postsecondary teachers who possess online teaching degrees educate the next generation of teachers. Job duties include creating curricula, writing academic papers, and presenting research findings at conferences. Although some postsecondary teaching positions may require only a master's degree, tenure-track positions, cater exclusively to applicants with an Ed.D. or a Ph.D.
Postsecondary education administrators work at colleges and universities, overseeing the work performed by a single academic department. Administrators who possess doctorates in teaching typically administer their schools' education departments. On the job, their responsibilities closely resemble those performed by principals. These administration positions typically require candidates to hold a doctorate and complete at least five years of teaching at the postsecondary level.